I had one of those serendipitous conversations with a colleague of mine earlier this week. My desk is just next to the main door into our office, so it's easy for people to walk in and prop themselves there for a quick chat - which is nice! Anyway, she's a hat nut like me, a reader and - as you'll see here - no mean writer either. 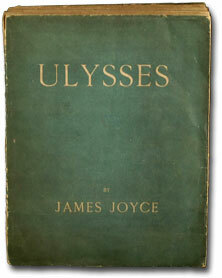 When she up and announced that she'd loved James Joyce's classic, Ulysses, I had to ask why. I've failed to get through this book many times, but have kept it, thinking that one day I'll grow into it. In telling me, she uttered a few rather choice descriptive phrases which prompted me to offer her a guest spot on my blog if she had time to commit them to paper. Which she did and it arrived in my work inbox this morning. So, without further ado, please meet Jessica Lim, sometime organ scholar at St James' King Street, Sydney, English and Music student at the University of Sydney and owner of a great many wonderful hats! In popular culture, James Joyce’s Ulysses has, in my opinion, been somewhat unfairly branded the most unreadable book in English literature. My experience with Joyce’s epic novel is that it is eminently readable, and quite enjoyable - provided one doesn’t care that much for narrative clarity; for reading Ulysses is very akin to taking a plunge in the ocean. Like an ocean, it is dizzying and beautiful and oh-so-fluid, with waves that come crashing and swirling around you in an engulfing, evocative experience. Like an ocean, it is difficult to pinpoint currents, waves, specific places. Just as I might walk out from a day at the beach and say, "It was lovely, and I swam in the ocean," so I walked out of Ulysses thinking, "Well, that was beautiful; hey, I just finished Ulysses!" That there are two main narrators for the course of the novel is relatively clear. The middle-aged and unhappily married Harold Bloom, and the nervous and artistic Stephen are identifiable by their individual speech patterns. (It is chiefly from Stephen's mildly pretentious voice that the reader is provided with mysteriously infused phrases such as "the ineluctable modality of the visible") The plot itself is more difficult to work out, and my recollection of it has boiled down to a rather simplistic outline that resembles something of a farcical comedy. There is the sexually frustrated, morose Bloom who is cheating on his wife, unaware that she is simultaneously cheating on him, and during the course of his day he encounters Stephen. The men part ways, Bloom returns to his wife (after his infamous masturbation-on-the-beach scene), recounts the day’s events, and she spends the final chapter reflecting on her husband’s tale and interpreting the day for herself. How Joyce manages to stretch such a simple plot with such a short time frame over several hundred pages is highly impressive. If Flaubert wanted to 'write a book about nothing', Joyce has left him in the dust. The final chapter, narrated by Molly, is perhaps the most famous chapter in the book. Running at over seventy pages (the exact number depends upon your edition), it has virtually no punctuation and no clear line of logical thought. A philosophy tutor of mine once used the final phrases of this sentence to try to argue the inaccessibility of art and the impossibility of achieving the perfect paraphrase, and though his tone was scornful, his point is there. It is impossible to paraphrase or neatly summarise Molly's scattered thoughts, impossible to even follow the 'logic' of her wandering mind. For seventy pages (or thereabouts) we follow the disparate flow of her thoughts. Perhaps the most succinct way for me to explain this chapter is the word Molly uses to open and end her internal monologue; the almost ineffable, affirmative "yes." Narrative clarity isn’t the main issue at stake in Ulysses. Instead, it is the linguistic experience, so rich it almost feels sensory, which Ulysses so uniquely offers; the linguistic experience, and an almost boundless freedom for interpretation. And for that, I must confess that I do count Joyce’s tome a modern masterpiece. For those who have the patience and inclination, read it. You will be richly rewarded.